We believe that life revolves around food, which in many (even most!) instances means it is revolving around a table. Like a fine painting, marvelous food presentations are further enhanced by a worthy frame in the form of tabletop settings. Few occasions call for more festive tabletops than holiday entertaining, so we asked Event Design Manager Randy Ballesteros to come up with Ten Tips for Holiday Table Decorating. 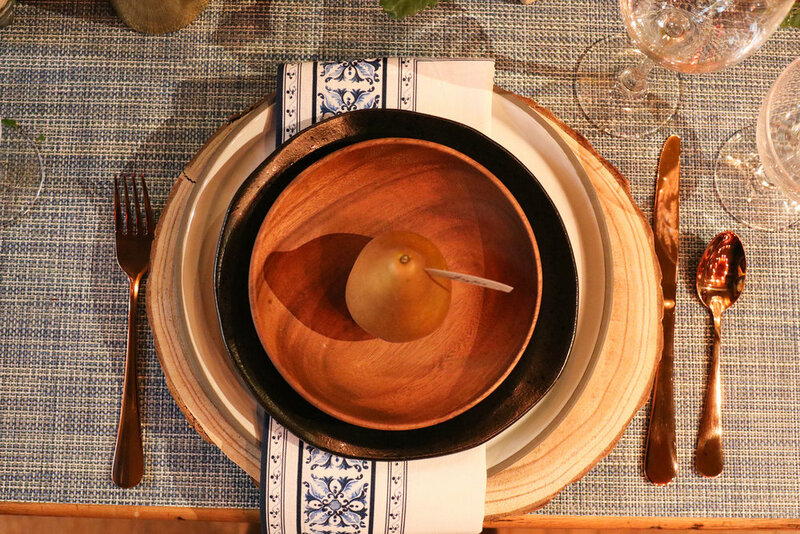 He rose to the challenge by designing an enchanting tablescape that mixes and matches various intriguing elements to produce a cosmopolitan look with a captivating sense of rusticity and nod toward sustainability. 1. A collection of seasonal plants - such as juniper, helleborus, lavender, cyclamen - mixed with various ferns in an assortment of pots lends a fresh, natural focal point to the center of the table. And they can serve as a lovely favor for your guests at the end of the evening. 2. Keep the conversation going by placing taller décor items in between place-settings so guests’ sightlines of each other are not blocked. 3. 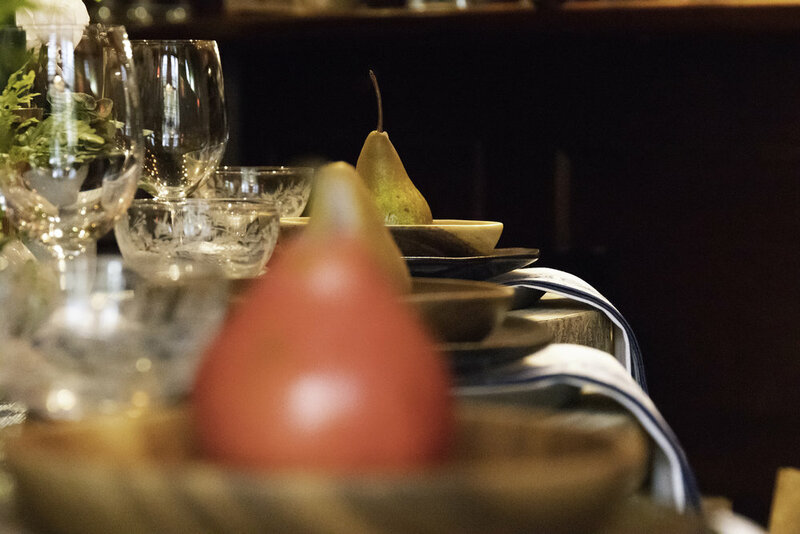 Seasonal fruits in bowls add a splash of color to the table, as well as tasty palate refreshing bites for your guests between courses. 4. 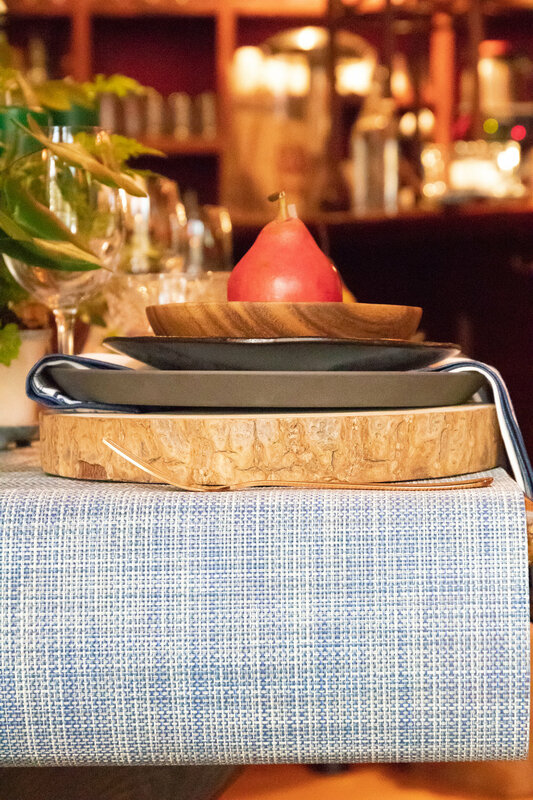 Adorn your table with runners as an alternate tablecloth. We used eco-friendly Chilewich runners. 5. Mix wood, ceramic matte, and gloss to yield an array of eye-capturing textures. 6. Don’t be afraid to mix metals as well. Copper and gold play surprisingly well together! 7. Colored candles are an easy way to add decorative depth and height to a table. 8. Specialty cocktails deserve a specialty glass! Showcase a delicious drink with etched glassware. 9. 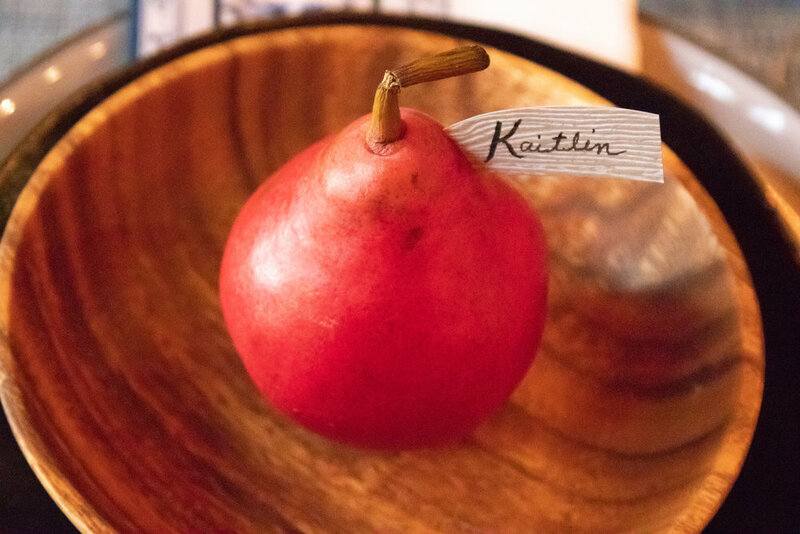 Have fun with place cards by displaying them in unexpected placement. 10. Graphic tiles, such as Moroccan ones we used, add a colorful patterns to the tabletop mis and act as efficient, yet decorative risers or trivets for hot food. Holiday Recipes for the Home Chef!